In medium bowl, stir together chicken strips and wing sauce. In large bowl, stir together potatoes, dressing, cheese and soup. Spoon into baking dish. Place chicken strips in single layer over potato mixture. In small bowl, stir together crumbs and butter. Sprinkle in baking dish. Cover with foil. Bake 30 minutes; uncover and bake 20 to 25 minutes longer or until potatoes are tender and juice of chicken is no longer pink when centers of thickest pieces are cut. Sprinkle with green onions. For authentic flavor, go with red hot buffalo wing sauce. Other flavors to try include teriyaki, sweet and sour or barbecue. For a cheesy hash brown side dish, omit the chicken and wing sauce. 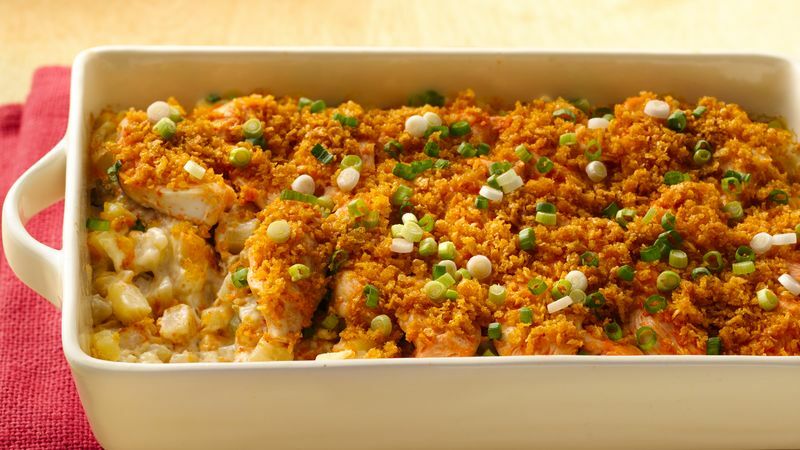 Serve casserole with barbecued chicken or baked ham. Try using precut chicken tenders to make prep time shorter. Serve with additional blue cheese dressing.